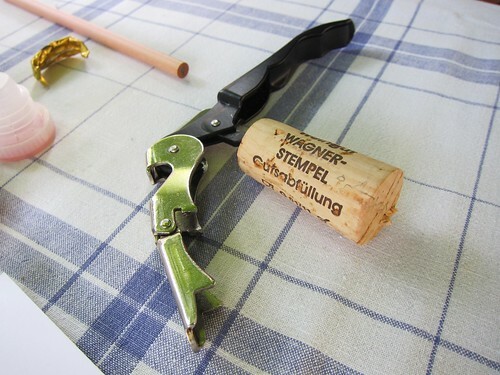 On tuesday, Martin of Berlinkitchen offered me to join him and Arthurs Tochter for a visit at Weingut Wagner-Stempel in Rheinhessen. A tempting offer I couldn’t resist. Daniel Wagner is a very down-to-earth man and, if that word exists, also a selfmade-winemaker. He took over the parental estate in the 1990’s and converted it from a mainly agricultural estate with wheat and sugar beets to a high quality winery. Of course they did also make wine before, but Daniel was the one in the family who made it a priority and the main focus of the estate. And today, only some 20 years later, he’s one of the shooting stars of the VDP, which he joined in 2004. But he’s still that down-to-earth family man. A man who made us a warm-hearted welcome when we arrived for the first time on his estate. He offered us a tour of his vineyards in his old VW bus, let us have lunch with his family and the team and gave us a thorough taste of his wine collection while telling his story. 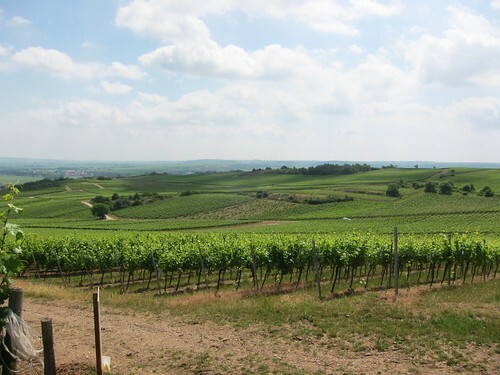 What a great day, beginning with a roller-coaster-ride driving up and down the hills of the Siefersheim vineyards. 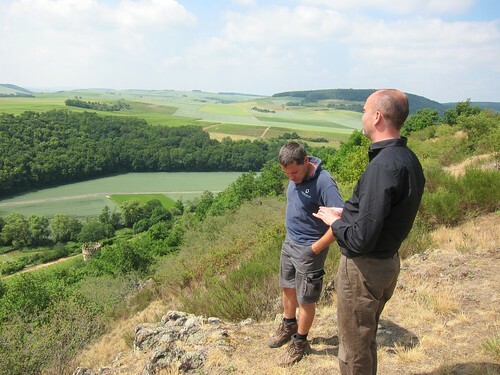 Daniel showed us his vines, explained the soils and how his grapes are able to ripen much longer on these slopes. 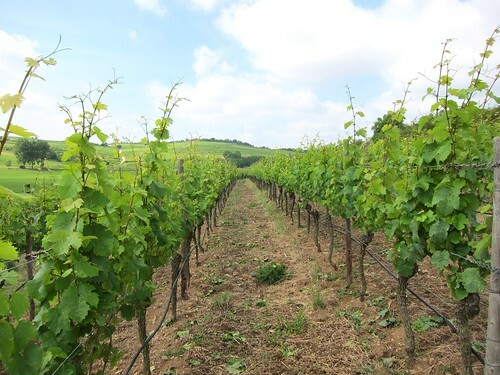 The estate is currently converting to biodynamic winemaking, but as many quality estates, it doesn’t change much of his working ideology.The main goal will always be the high quality of the wine and not some “organic” sticker on the label. But it naturally also makes for a more healthy working environment. On top of the Goldenes Horn. 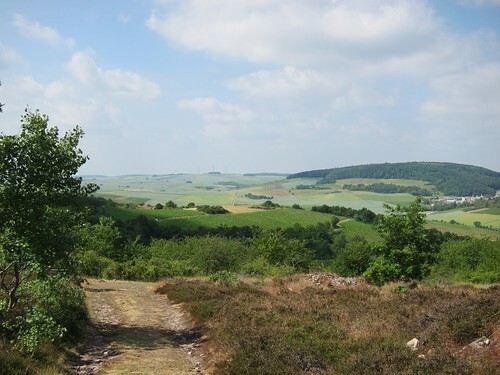 The hills on the far-end are those of the Rheingau wine region. 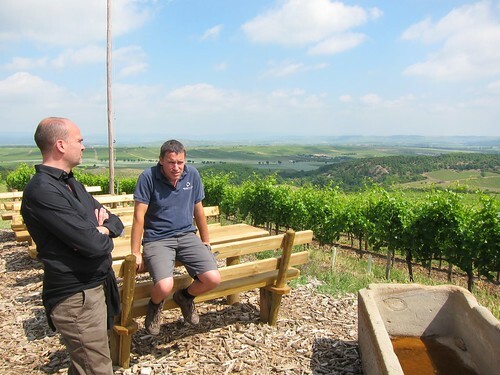 Standing on top of the Heerkretz vineyard, Daniel’s flagship Grosses Gewächs. After the tour we had a nice lunch with the team and Daniel’s family, where each day 3 wines are poured blind as a guessing game. 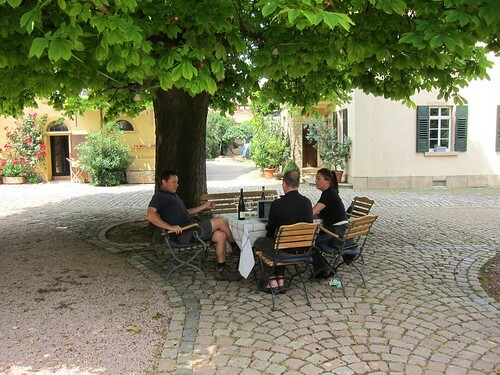 Then, we sat down at the tasting table under a huge chestnut tree and started sampling the 2010 wines of the estate, starting with the Silvaner’s which did really well in this rather fresh vintage. 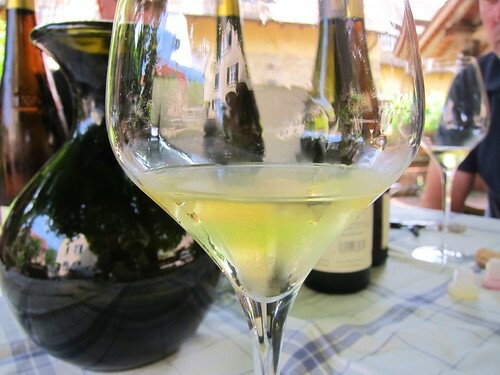 2010 Estate Grüner Silvaner (around 7,5 Eur) – gently perfumed nose. Vibrant on the palate with fresh acidity, smoke and spice – a thirst-quencher full of contrasts and a very good fun-for-your-money-ratio! 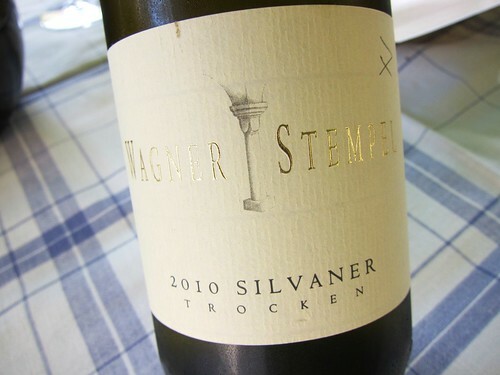 2010 Siefersheimer Silvaner (14 Eur) -beautifully perfumed nose. Soft, round and creamy with good weight on the palate, complexity with smoke notes, good freshness and balance – a very elegant Silvaner with a velvety yet refreshing touch. This one is propagated as a secret tip by some, and they’re probably right! All “Village” wines (Ortsweine) are closed with a cork which Daniel prefers for a wine with a certain aging potential. Daniel told us about his beginnings. When he came back from an internship in California, he was motivated to plant some international varieties like Merlot or Sauvignon Blanc. Looking back, he probably wouldn’t do it again today and jokes that he was young and needed the money. But this is again a testimony of a winemaker who followed his own path and when tasting his SB, one does recognize a typical Wagner signature and not a generic SB. 2010 Sauvignon Blanc (13 Eur) – this is a slim beast with incisive freshness. Nose of cassis, grapefruit, just a hint of grass. Tart and intensely mineral on the palate, again cassis, captured within vibrant acidity – great freshness and good presence. Truly not a generic SB. Then we went on to the Rieslings, which are of course the main focus of the estate. 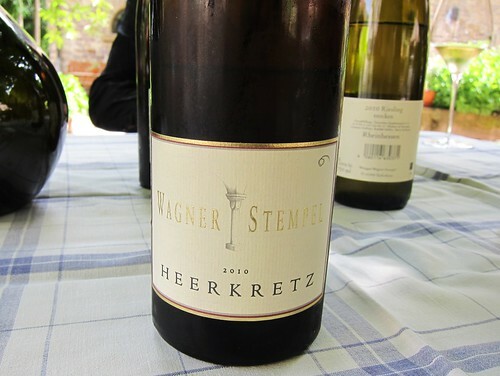 2010 is a vintage of mineral-driven and fresh Riesling with intense, vibrant acidity. 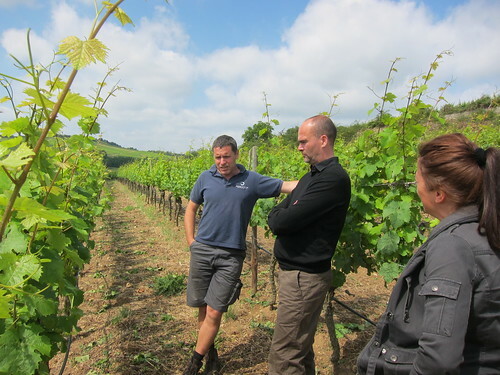 A winemaker’s year where one needs talent and hard work to achieve balanced wines. 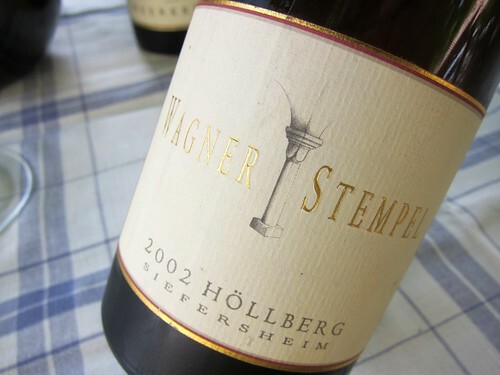 At Wagner-Stempel, acidity was intense, but always well integrated and with great drinkability. 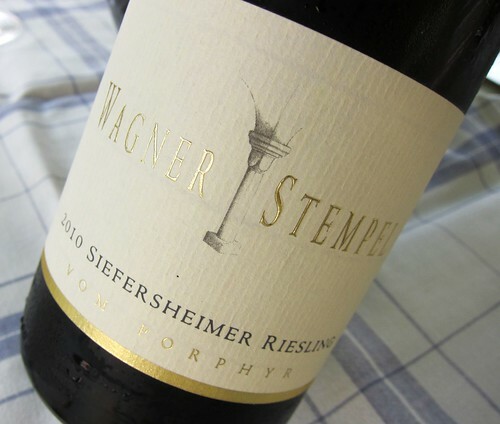 2010 Siefersheimer Riesling vom Porphyr (14 Eur) – a beautiful Riesling. A nose full of fruit and herbs. On the palate, lots of minerality rendering a nearly salty impression as well as a long finish on herbs. Great presence and always appearing fresh and balanced. A great value. 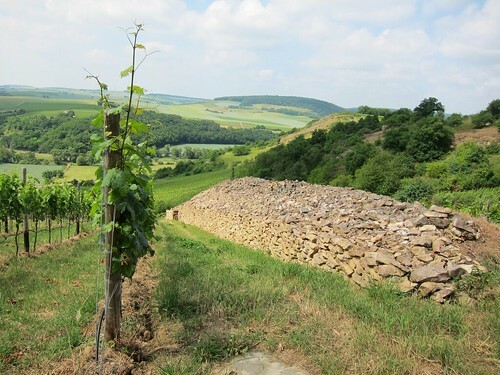 2010 Siefersheimer Höllberg Grosses Gewächs (24 Eur, available in Sept.) – Daniel Wagner’s focus is minerality, and you couldn’t see it clearer than in his GG wines. Höllberg shows an intense, salt-like minerality and nearly seems a bit filigree with fruit. Slight yeast touch still in this barrel-sample. Very good presence and length and a perfectly incorporated acidity. If one likes the mineral style, then he will love 2010 Höllberg. 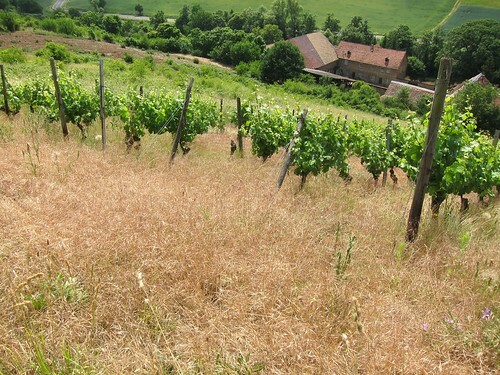 2010 Siefersheimer Heerkretz Grosses Gewächs (29 Eur, available in Sept.) – Grapes have been harvested late in November. I felt it shows a bit more fruit but, then again is equally mineral as the Höllberg. The acidity transports intense herb notes. Great presence and length. Great balance. Then, as a final dry Riesling pour, a grandiose 2002 Höllberg. Elegant nose of petrol and biscuit-dough. Superb freshness and balance on the palate. Great to see how well these can age! 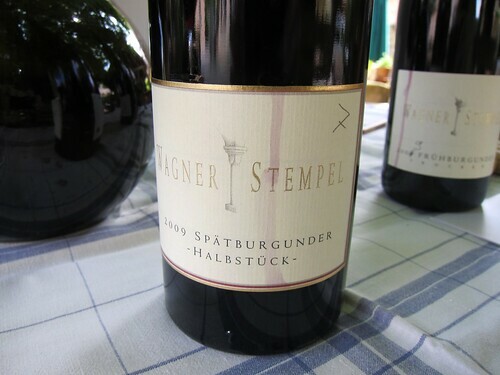 Finally a sip of the 2009 Spätburgunder Halbstück, a Pinot that Daniel only makes in very good vintages. Which 2009 allegedly was for Pinot all over Germany. A dense and balanced wine with a rustic core. Beautiful fruit and a good backbone to chew on! Barry, another one for you! What a great day it was, and what great wines. Always impressive to see when a winemaker’s style is recognizable in each and every wine one tastes. Daniel is a fervent defender of puristic wines. 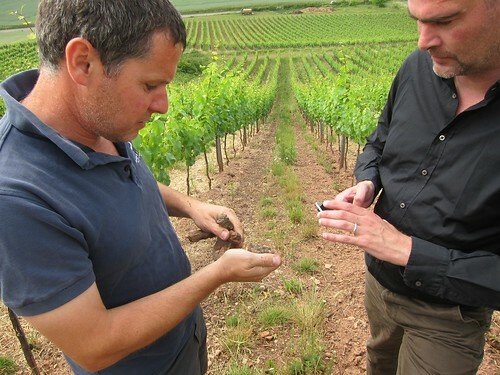 He wants his dry Rieslings to be dry and reflect the essence of his vineyards. While there is evidently also fruit in his wines, he prefers to focus on minerality because, as he says, the fruit will go away but the minerality will stay. Thanks for this wonderful tasting! Following, some more commented impressions. 2011 so far, very promising. Let’s keep fingers crossed. View from the Goldenes Horn towards N/E . 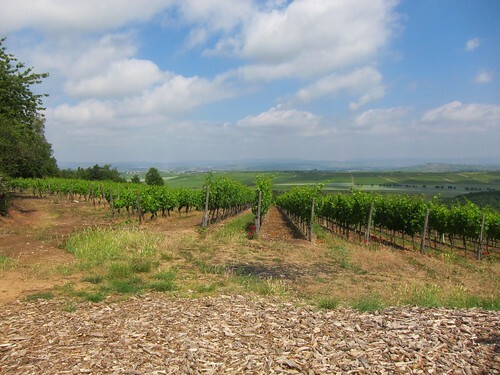 Top of the Goldenes Horn, view towards N/W – this is at the same time a nature reserve – These are the last vineyards on the Northeastern tip of Rheinhessen, then comes only farmland. 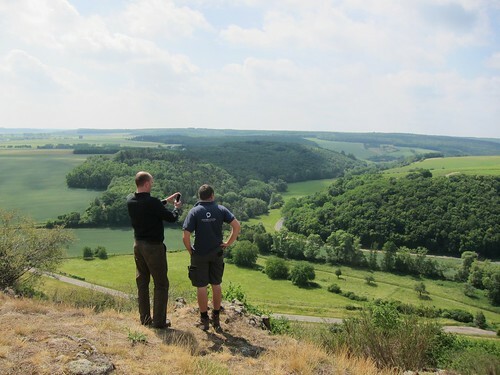 Standing on top of Heerkretz – stunning view! 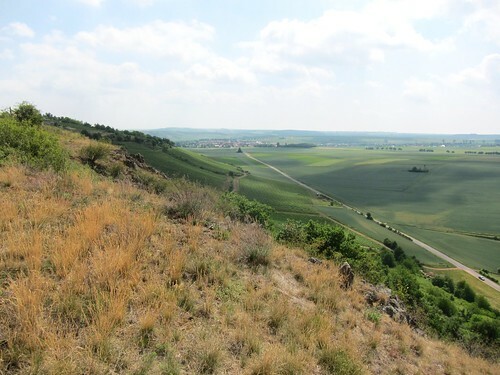 The Heerkretz slopes with Siefersheim in the far end. Standing in a particular parcel of Heerkretz, where porphyr and melaphyre stones are equally abundant. 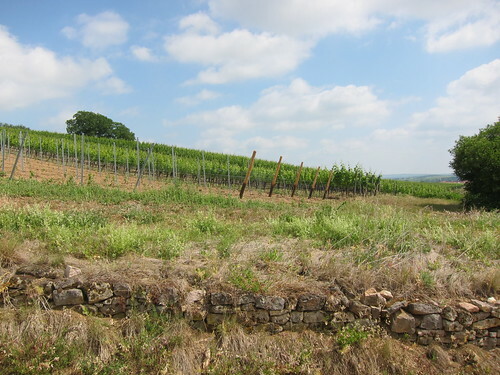 Ancient wall within Heerkretz vineyard. Sampling a newly acquired parcel, even a bit further West than Heerkretz. Very promising, according to Daniel. Tasting wines under the chestnut tree. JA! War ein schöner Tag! Ich hab zu danken! Ok, nächstes mal photographiere ich nur noch von vorne! :P Aber deine Sorgen sind unberechtigt!